Fall is finally here, and I’m really excited about being able to make my homemade applesauce! It’s hard work, but it’s definitely worth it! 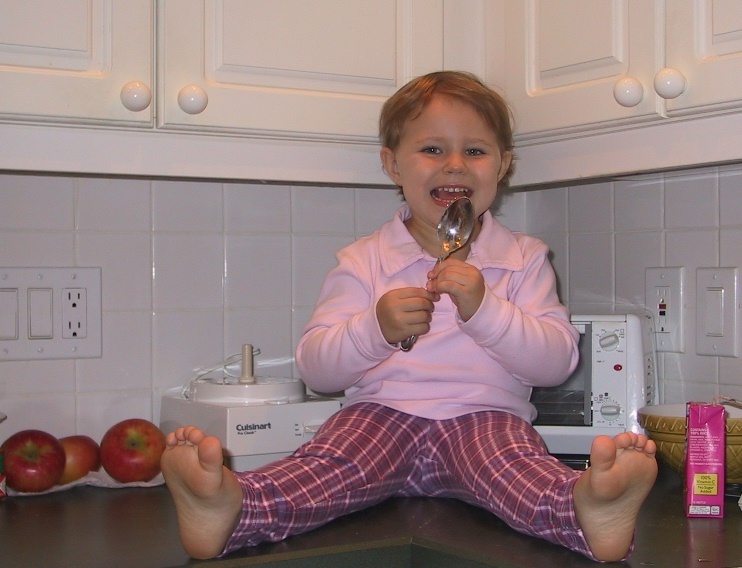 This is where my passion for cooking started; when I was about 2 years old, my mom put set me on the counter and give me the task of stirring the pot and adding the spices. Now I’m able to make the applesauce all by myself (with a little help and guidance from mom!) Here’s a picture of me helping mom out when I was 2. If you don't like cranberries, just leave them out to make a delish plain applesauce. Rinse off apples. Pour apple cider into large pot. Core apples with apple slicer/core device, discard cores. If you don't have a food mill, you can remove apple skins before placing slices into pot or cook slices with skins on and skins will fall off after cooking. Place apple slices and craisins into pot and bring to a boil. Add several dashes of spices but use slightly less of cloves and nutmeg because they have a strong flavor so you don't want to add too much. Cover pot and lower heat to medium low and cook for 1.5 hours, stirring occasionally. As the apples cook, the skins will start to fall off. Taste and adjust spices to your liking. Continue to cook for about another hour. If you have a food mill, this is when you will use it to remove the skins and blend the applesauce. If you don't have a food mill, spoon out skins and blend apples with an immersible hand blender to the consistency you like. Move pot to cool spot on stovetop to let applesauce cool before bagging and placing in freezer. To help applesauce cool faster, put half of the applesauce into another pot or large bowl. This recipe makes about 6 quarts of applesauce. Freeze most of the applesauce into quart sized ziplocs and freeze laying flat in freezer. Save the remaining applesauce in your frig to eat right away. You should try adding different, unique things to your applesauce once it’s done cooking, like walnuts or uncooked oatmeal! What a wonderful addition for making applesauce. Thanks, Lizzie! Sounds delicious, thanks for sharing! Sounds yummy, Lizzie. I've never tried applesauce. But it sounds good! Anyways, happy Halloween!